If you’re in the market for a playard you’ll want to check out this deal. Right now this Evenflo Portable Babysuite Deluxe Playard is on sale for $52.80 Shipped (Retail $99.99). The Evenflo Portable BabySuite Deluxe offers parents convenient space for Baby Care and Play. The new fashions and long list of amenities keep baby comfortable and look great doing it. 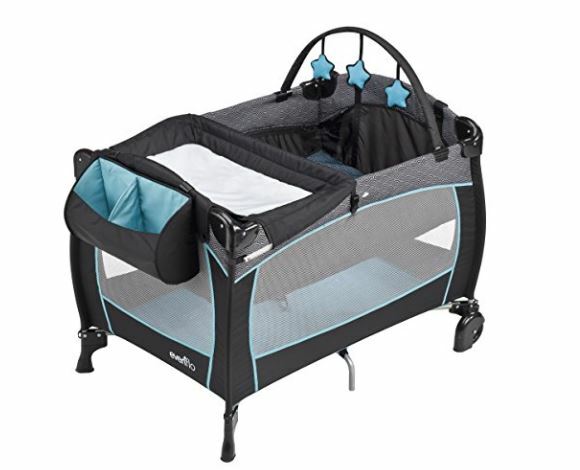 The Rotate-to-Store changer and Full Size Bassinet keep baby’s space convenient. The padded floor mat converts to Playtime Playmat with attachable toy bar to create a clean, safe play space for your baby. And when portability is necessary, the BabySuite Deluxe quickly folds and goes into the matching carry bag to make your travel a breeze.The playard offers a fabric console with storage compartments to store diaper-changing supplies and other essentials.